Terracotta pots are one of the most popular planters and they look pretty regular – just a ceramic, nothing special. But, when you think about decorating them, you will find out that there are plenty of ideas that you can implement here. What is your favorite DIY technique? Do you like drawing with sharpies, or decoupaging pretty napkins maybe? 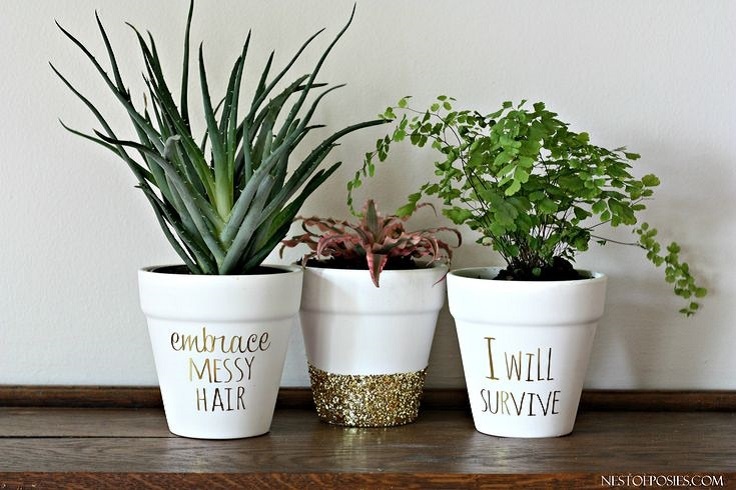 You can paint and glue stuff on your terra cotta pots and after that, they won’t look that pretty regular – they’re going to be your newest home decoration! If you want some inspiration on what you can do with just a few materials, scroll along. The marble effect is so mesmerizing! Ever since it got very popular few years ago, it inspired so many DIY projects, so it’s no wonder why there are so many of them with this wonderful effect! 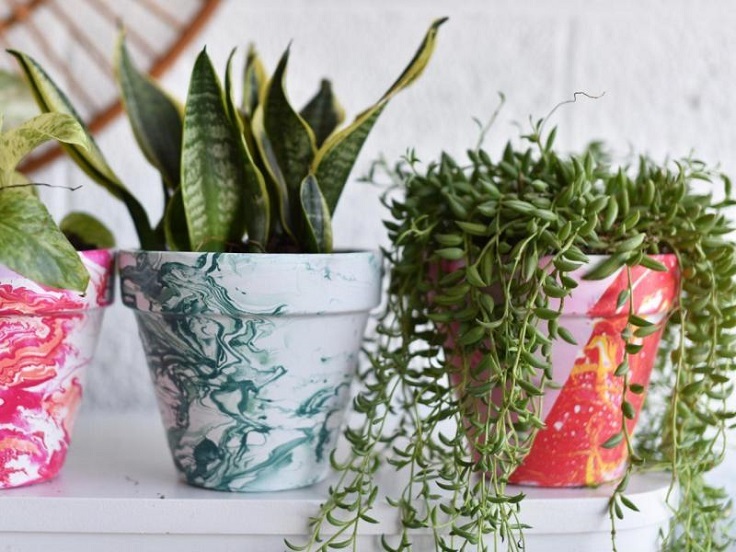 Definitely one of our favorites is the marbled terra cotta plant pot. To make your own, you need 6 inch terra cotta pots, white spray paint, dropcloth, two nail polish colors, disposable bowl filled with lukewarm water, toothpick, clear acrylic spray paint and disposable gloves. Get your paint and your paint brushes and let your inner artist out! 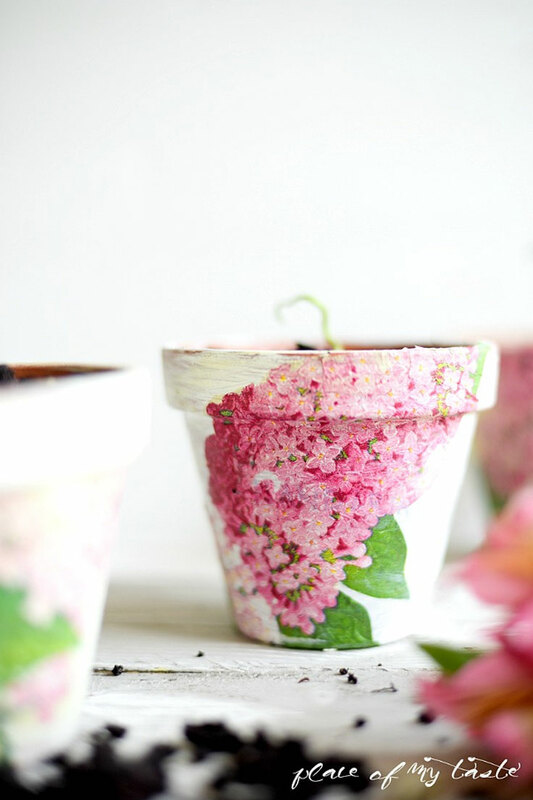 This one is such an easy project to make, plus is also very cheap and the outcome is very lovely – add pretty flowers and you can give these terra cotta pots as a gift to a dear person. 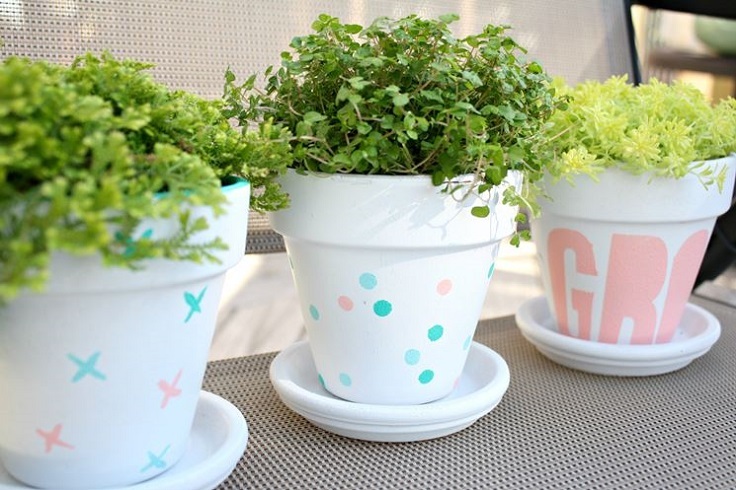 They are definitely one of the cutest plant pots you’ll ever see! 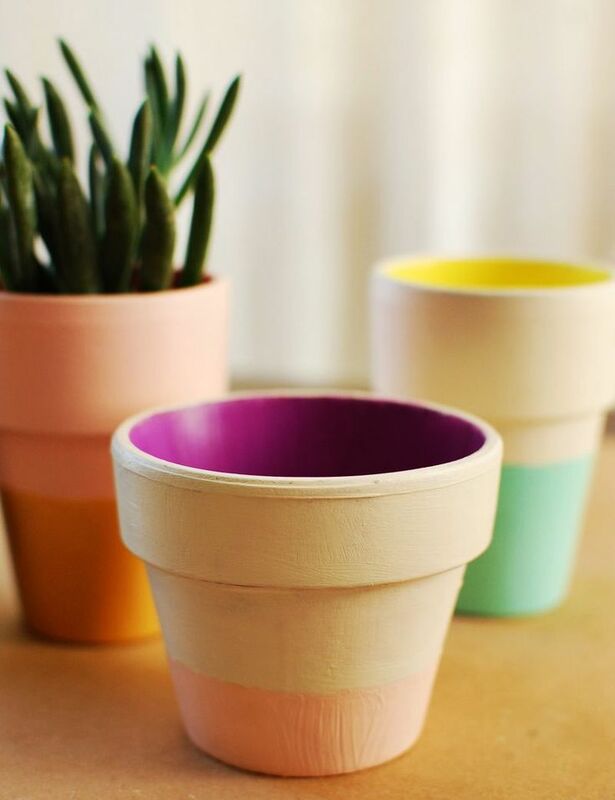 Pastels are such a great inspiration, even when it comes to something so basic such as terra cotta plant pots. If you like these, then you need to get the following materials – terra cotta drip trays, stencil, mailbox letters, paint tray (or paper plate), tape, sponge and acrylic paint. You can literally make them as adorable as you want them to be! Isn’t so fun to draw stuff with sharpies? They offer such preciseness and it’s so easy to draw whatever shape that we want, especially if we have the talent! The sharpies are exactly why this project is that budget-friendly – you just need the markers. The rest is up to you – what would you like to draw? Shapes, patterns, or maybe even writing down some quotes? Do you feel like cutting paper and doing paper projects? Well, this is something you might be interested in. The lovely pattern on the terra cotta pots is actually cut out from a paper doily and then used as a template. So, think about what kind of shapes and patterns you want on your terra cotta pots? Once you decide, get your paper doily and start cutting! A little bit of glitter is what makes things so admirable! After all, glitter is fun to play with, right? These terra cotta pots look so nice and you can even use them as a gift for a dear person, especially one who loves gardening or DIY projects. Make sure to get a gold foil printable paper and glitter for the decoration. They look so fabulous, right? 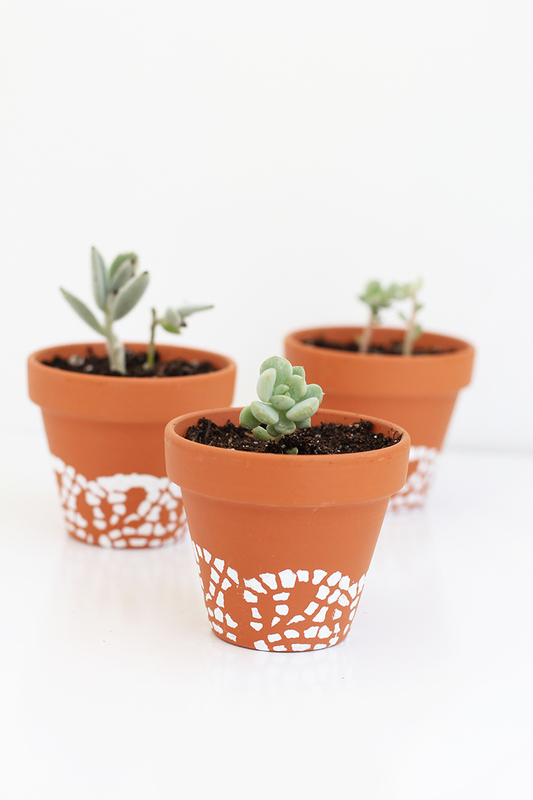 Geometry is always here to inspire us and these terra cotta pots aren’t an exception. 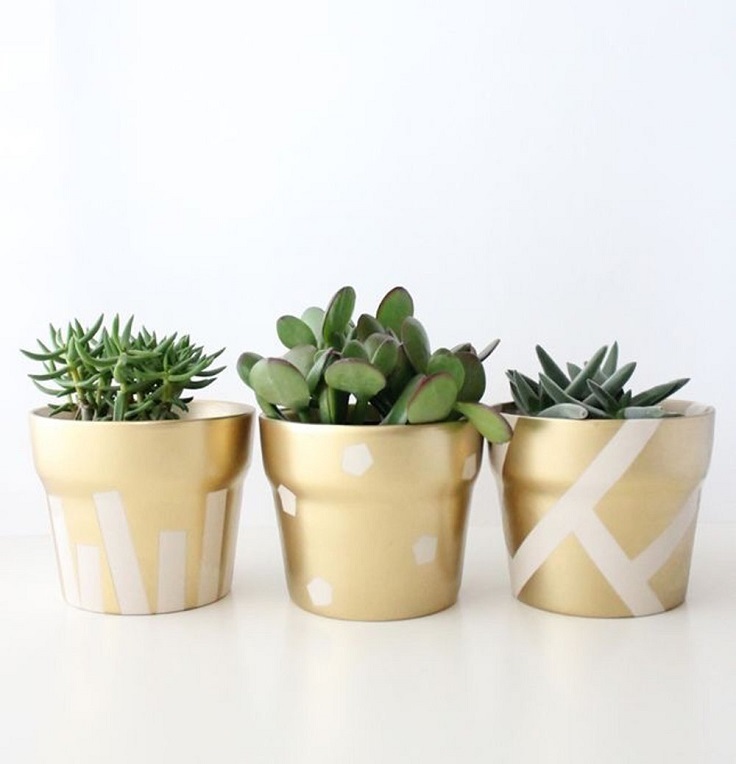 The coats of gold spray also have an important role here – with such plant pots, you will have your newest decoration being complimented all the time! This is a very interesting project which allows you to experiment with the shape. Get creative and allow your imagination to inspire you! There’s just something so charming about these old-aged terra cotta pots. They’re the perfect choice if you trying to achieve a vintage or rustic look for your garden. 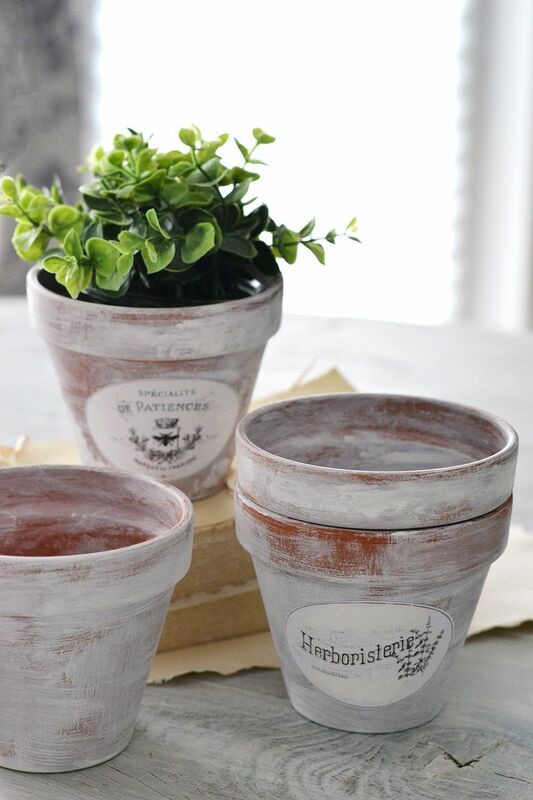 For this project, besides the terra cotta pots, you will also need white milk paint, acrylic paint or chalk paint, brushes, Mod Podge, scissors, cardstock paper, ink or laserjet printer and oval French labels. However, on the link below the photo, you can get free French-inspired printables! 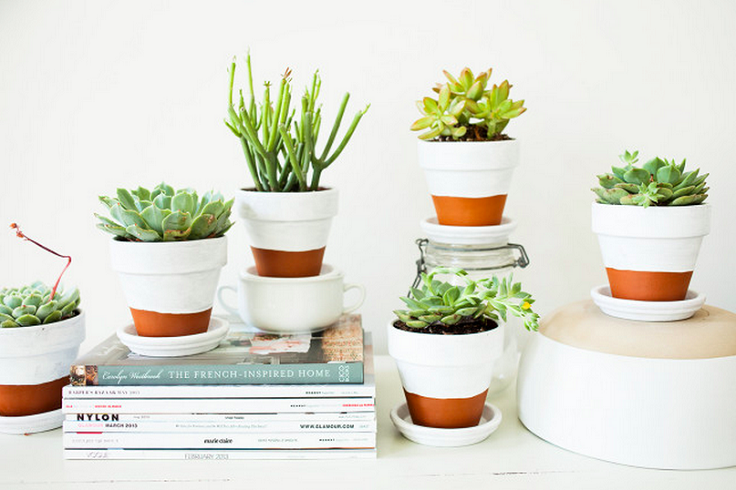 Aren’t these terra cotta pots absolutely amazing? The look so gorgeous, it made us want one right away! If you’re not a person who like floral themes, then just choose decorative napkins with other patterns or shapes, but just make sure they’re easy to cut out. Besides this, you will also need mod podge, paint brush, paint (such as acrylic paint) and scissors. 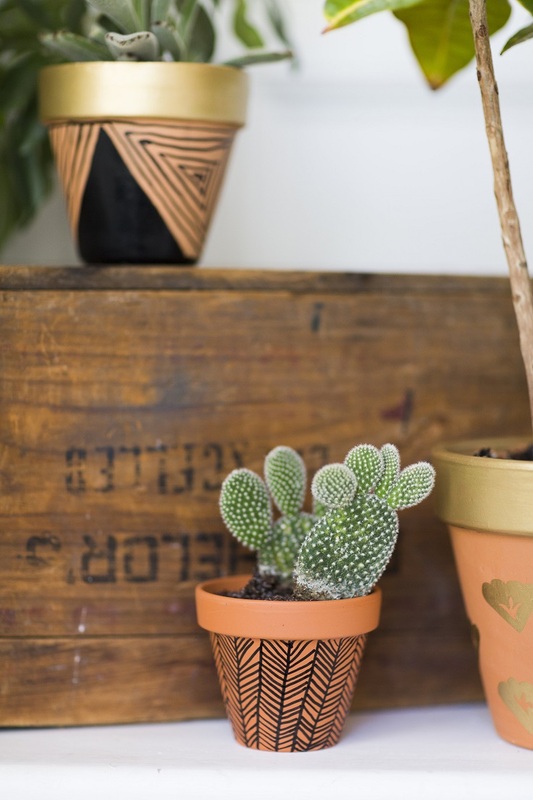 And last, if you really don’t feel like spending too much time on your terra cotta pots, but still want them decorated, then you can just use one paint. Look how good white looks here, although any other color that would also suit these pots. This is a simple look, yet it will be such an adorable addition to your interior. Love it! Some people never think to decorate the pots! !